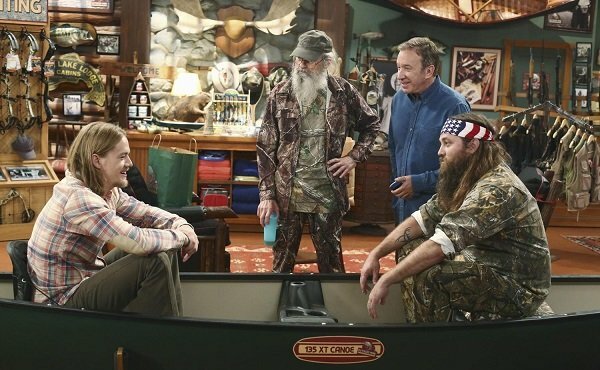 ABC’s Last Man Standing Season 3 premiered last week-end by welcoming Duck Dynasty’s Willie and Si Robertson in the first episode, Back to School. Willie and Si Robertson are visiting the sporting goods store in preparation for a man-versus-nature challenge. “We don’t want nature to have a chance,” as Uncle Si Robertson puts it. There are also oddly juxtaposed jokes about wearing camouflage to church and studying philosophy. Max Baxter (Tim Allen) and his family welcomed the Robertsons who were quipping about deer hunting and whatnot. Willie and Si Robertson are also a little concerned about “Lady-beard”, aka Kyle (Christoph Sanders). It seems that Mandy broke his brain with all of her intellectual college talk. Willie Robertson knows what to do though. Si Robertson, however, seems to be advocating murder as a more permanent solution to the problem. Last Man Standing Season 3 premiered on Friday, September 20 at 8 p.m. on ABC.